Toyota certainly took its time with this one. The JPN Taxi concept debuted four years ago at the 2013 Tokyo Motor Show, but the cat is finally out of the bag now, with hardly any changes done to the design. It’s officially on sale in Japan starting today, with two variants – Nagomi and Takumi – forming the line-up. Both share the same LPG-hybrid (liquified petroleum gas) system, comprised of a 1.5 litre 1NZ-FXP four-cylinder engine from the Toyota Hybrid System II family. No key figures have been released so far, but Toyota says the front-drive car is capable of driving 19.4 km per litre of fuel with extremely low levels of CO2 emissions. The Japanese company also claimed superior maintainability of the engine, thanks to use of a no-maintenance power water pump (this is driven by an auxiliary belt system), thus contributes to lower repair costs. Suspension choice is MacPherson struts for the front and multi-link type for the rear, both of which have been designed for maximum durability. In terms of design, Toyota said the JPN Taxi was “designed to be recognisable by customers at a glance and to last for decades, transcending trends.” Up front, it gets the company’s famous horizontal lattice motif grille, a hallmark feature that stretches back through generations from the Crown Sedan and Crown Comfort. The side mirrors rest atop the bonnet instead of the A-pillars. The entry-level Nagomi gets halogen reflector headlights while the Takumi benefits from bi-LED projector headlamps. Round the side, the duo gets differentiated by wheel design and chrome door handles. Completing the exterior is a pair of LED combination lamps with a protruding three-dimensional design, but only the Takumi gets vertical rear lights on the D-pillars, painted rear bumper and a chrome trim on the tailgate. Inside, the dispatch system, air conditioning controls (the front air vents feature Nanoe6 air purifier; the Takumi gets rear air vents and ceiling air circulators) and other driver-specific features are placed on the right, while the GPS navigation system, taxi meter, and other instruments are placed in direct view of the passengers. Interestingly, the hazard lights switch is built into the right side of the steering wheel, because Toyota said the feature is very frequently used among cabbies. Some clever design features include a low, flat floor, making it easy for customers to ingress and egress. Comfort is prioritised – the rear bench, which also has heating function, is positioned closer to the floor, giving ample headroom (230 mm) and the flat design makes it easier for passengers to move sideways. The seat belts are lit by LED and are intuitively located for ease of reach. The rear-left door features power sliding and a ramp for the benefit of wheelchair users. When not in use, the wheelchair can be stowed away in the boot, which measures at 401 litres. That’s large enough to swallow two large suitcases or four golf bags. The JPN Taxi can be had in three colours, including the newly developed koiai deep indigo. The colour is created with reference to the country’s ancient roots, where Japanese people used to wear indigo-dyed clothing. Outside of Japan, deep indigo is referred to as Japanese indigo. Lastly, safety. The Toyota Safety Sense C (TSS-C) system and six airbags are standard for both variants, but the Intelligent Clearance Sonar, which actively detects obstacles and helps prevent collisions caused by sudden acceleration, remains as an option. The Toyota JPN Taxi will make its grand debut at the 45th Tokyo Motor Show that’s happening this week. It will go on to greet visitors from around the world in 2020, when Tokyo hosts the Olympic and Paralympic Games. Pricing starts from 3,277,800 yen (RM122k) for the Nagomi and 3,499,200 yen (RM130k) for the Takumi. Toyota plans to sell at least 1,000 units of the JPN Taxi monthly, and it will be produced at the company’s Higashi-Fuji Plant. Agree that this is one Hell-of-an-Ugly van but it’s priority is spot on. 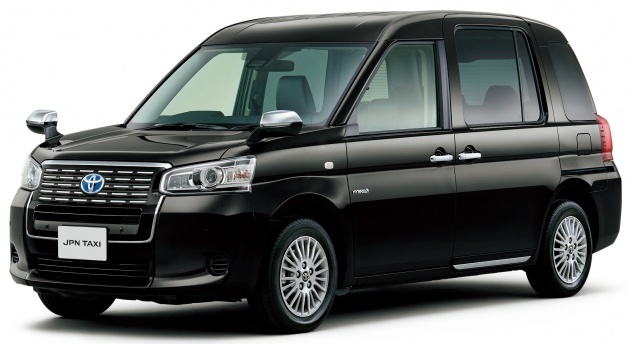 This new JPN Taxi is ideal to replace the existing Toyota Crown taxis in Hong Kong & Singapore. When will Malaysia realize they need world class spacious practical taxis ??? Instead of the uncomfortable and tacky Proton ? Come on LAH !!!!! Change gear to being world class. One of the first tangible things tourists experience are a country’s taxis. And yes, penalize taxi drivers who cheat and don’t use the meter. SPAD has not been successful in tackling taxi drivers who cheat. I wonder why !?!? A copycat of the London cab. London black cab has better design layout. The back row bench is pushed back towards the back of the car (leaving no room for suitcases) to accommodate another row of foldable seats facing the former. That way, the cab can accommodate more people and whatever suitcases there are goes down the middle. Without looking at the Title of this article, I thought it was a mini hearse! And yes, it’s got bad proportions.